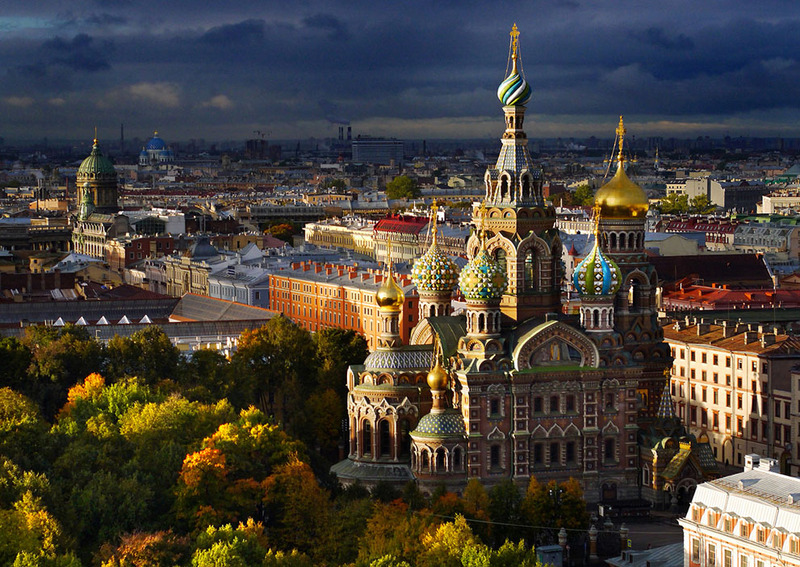 St Petersburg – One of the world’s most beautiful cities. Cruise on River Neva. After a buffet breakfast at the hotel, check out and proceed to the train station to board the new high-speed train ‘Allegro’ to St Petersburg. This train, which was introduced on December 12, 2011, gets you to St. Petersburg in less than 4 hours. Enroute, lunch will be provided. Arrive into St. Petersburg – ‘Venice of the North’ and check into the hotel. Later, enjoy a cruise on the Neva River. It is one of the best ways to view the majesty of the St. Petersburg’s 18th century architecture and craftsmanship. The cruise will expose you to the magnificent panorama and stunning sights of this great city. It will pass under the main bridges of St. Petersburg which will unfold the city’s history and its legends connected with the waterways. Tonight, enjoy an Indian dinner. After a buffet breakfast, proceed on a guided city tour with a local English speaking guide. See the St. Isaacs Cathedral, Nevsky Prospekt, the Rastrelliesque Stroganov Palace, the neoclassical Kazan Cathedral, the Russian National Library, the Statue of Peter the Great, the Peter & Paul Fortress, Summer Garden, Smolny cathedral and many more sights. Later, visit the Hermitage Museum, a museum of art and culture in St. Petersburg. It is the largest and oldest museums in the world with collections comprising of nearly three million items including the largest collection of paintings in the world. Later, get set to enjoy the spectacular world famous Russian Ballet (not included in the price). Tonight, enjoy an Indian dinner. Visit Peterhof Palace & Gardens. After a buffet breakfast, proceed to Peterhof. It is famous for its series of palaces and gardens known as the Peterhof Palace, laid out on the orders of the Russian Tsar, Peter the Great and sometimes called the ‘Russian Versailles’. The park holds numerous fountains and few monumental cascades which are one of Russia’s most famous tourist attractions. Later, visit the Grand Palace entering by the ornate Ceremonial Staircase and see the Ballroom, Throne Room, the Western Chinese Study, the Drawing Room, the Imperial Suite, the Oak Study Room and the Crown Room. Later, drive back to St. Petersburg. After lunch, the afternoon and evening is at leisure to enjoy the city on own or at the Nevsky Prospect for some shopping. Tonight, enjoy an Indian dinner. Moscow – the Capital city. Enjoy the world famous Russian Circus (not included in the price)..
After a buffet breakfast, check out and proceed to the train station to board the high speed train ‘Sapsan’ (train tickets are not included in the price). This train gets you to Moscow in 3 hours 30 minutes. Arrive into Moscow – the financial and political centre of Russia and the former Soviet Union. It also boasts the largest community of billionaires in the world. After lunch, drive to your hotel and check in. Later in the evening, see the world famous Russian Circus. For over two centuries circus has been an important part of Russia’s rich cultural heritage. It is a truly universal form of entertainment enjoyed by all, regardless of race, religion, language, social class, education or age. Tonight, enjoy an Indian dinner. Guided city tour. See the magnificent Kremlin and the Red Square. After a buffet breakfast, proceed on a guided city tour with a local English speaking guide. Explore the Kremlin Grounds, Cathedrals and see the Patriarch’s Palaces in Moscow. The small city in the center of Moscow, once the residence of Czars and Patriarchs, contains Russia’s main Cathedrals, Assumption Cathedral, Archangel’s Cathedral and the Deposition of the Robe Cathedral. Also visit the Patriarch’s Palace – a museum of seventeenth-century life and applied art, displaying ecclesiastical regalia, period furniture, gold and silver ware from Russia and Western Europe. The palace dates back to 1640 and incorporates the Church of the Twelve Apostles, which was the private place of worship for the patriarchs. Next, experience the Metro, the most reliable and rapid transport system, connecting the central part of the city with industrial, residential areas and neighbouring towns. Moscow metro is the world’s leader in the volume of traffic and reliable transportation. You have some time at leisure to explore Moscow on your own. Tonight, enjoy an Indian dinner. Farewell!!! This morning, after a buffet / boxed breakfast, check out and proceed to the airport for your flight back home. Return home with great experiences and wonderful memories of your holiday with Vacations Exotica.